Typical sounding rocket flight. Credit: NASA. A sounding rocket is a research rocket that sends equipment into the upper atmosphere or near space on a suborbital trajectory, takes measurements, and returns to the ground. Sounding rockets take their name from the nautical term "to sound," which means to take measurements. After launch, as the rocket motor uses its fuel, it separates from the payload and falls back to Earth. Meanwhile, the payload continues into space and begins conducting the experiment. In most cases, after the payload has re-entered the atmosphere, it is brought gently down to Earth by way of a parachute and is then retrieved. By recovering parts of the payload, it can be refurbished and flown again, resulting in great savings. Scientific payloads are carried to altitudes from 30 miles to more than 800 miles. And although the overall time in space is short (typically 5 to 20 minutes), the experiment is perfectly positioned to carry out its mission successfully. 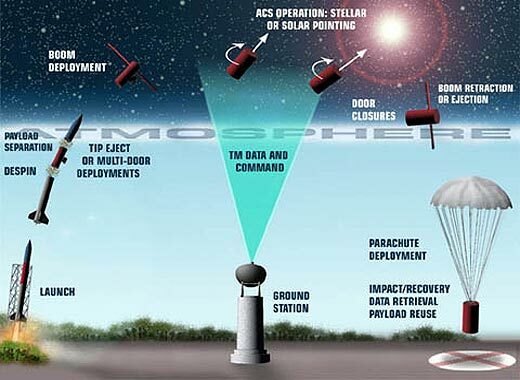 Data is often collected and returned to Earth by telemetry links, which transfer the data from the payload directly to researchers on the ground.